First of all, thanks for the great community engagement the previous post had and for all the feedback received! As introduced in the previous article on “Using IOTA as a solution for the USD$65.7 trillion Asset Management industry”, IBERIAN is an IOTA based project that aims to disrupt the finance industry by enabling the creation and management of digital asset funds on an open source software platform built on top of the Tangle. I strongly recommend to read the post first for a better comprehension of the one below as this is a continuation of it. IOTA is a DLT that, unlike any other, is feeless, infinitely scalable, ternary and quantum computer resistant. In words of Cara Harbor: The Tangle is a permissionless, no-fee distributed ledger, designed as the basis of a global protocol for the Internet of Things that does not rely on traditional blockchain technology. Industry partners are developing concepts with IOTA across automotive, mobility, eHealth, and smart energy sectors, as well as social impact and government regulations, supply chain, and global trade activities. The Tangle, Qubic smart contracts and Oracle machines will be the responsibles for the efficiency and reliability of the project. Be a solution for companies inside the asset management industry (Hedge Funds, Mutual Funds, Pension Funds, Investment Banks…). Be a solution for individuals that have the brain but not the capital resources to create a traditional investment fund. Be a solution for investors, the decentralised IBERIAN Fund Marketplace provides an easy and secure way to invest money. 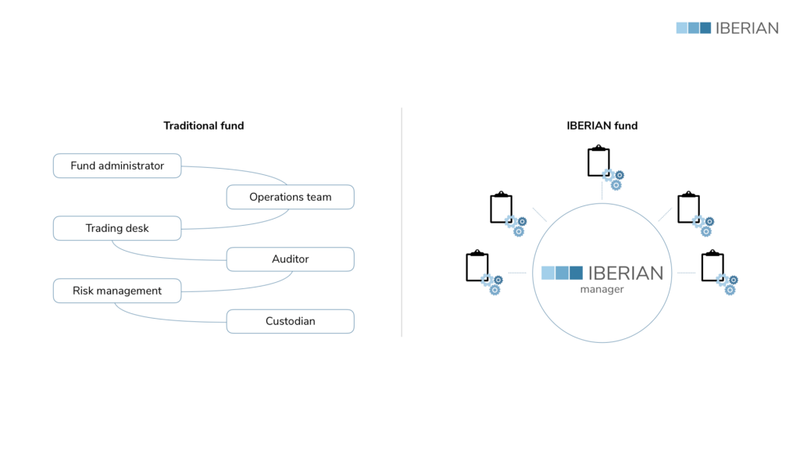 IBERIAN is a way for creating more efficient Funds while dramatically reducing costs, enabling a much more efficient asset management activity. On one hand, this will be archieved by offering a complete asset management software platform where investment entities can customise every aspect of a fund and how the fund is managed choosing between different service providers for aspects such as the Exchange, the Price Feeds, support for trading algorithms (if any) and many others. On the other hand, entities have the ability to dramatically cut costs associated with the traditional asset management activity by transitioning to a digital fund structure using IBERIAN, where only a Manager, helped by Qubic smart contracts, is needed. This enables cheaper, more secure and efficient funds. This will also help companies attract more investors for free since they will be listed on the IBERIAN Fund Marketplace, which we will talk about a bit more extensively in a couple of minutes. Here is the main problem (and opportunity) that this industry presents at the moment, individuals with the intellectual capacity for managing an investment fund but not with the capital needed to set up a fund and compete with the current industry leaders ( USD$100,000,000) are left aside and makes it very difficult for them to make a living out of it. The economic and legal entry barriers makes it almost impossible to set up a fund. IBERIAN, thanks to DLT and cryptocurrrency focused investment funds have the ability to change that: individuals will have now the possibility to create and manage their own decentralised investment funds and manage their money and the one of the people that trust them. Eventually, if they build a reputation proving to be profitable and trustworthy over time, even manage to attract more potential investors on the Fund Marketplace due to their outstanding performance. It is important to differenciate between the two different types of investors (in terms of our our purposes): Investors that know about finance but don’t want to manage their savings themselves and the ones that don’t know about finance but want their money to grow as well.